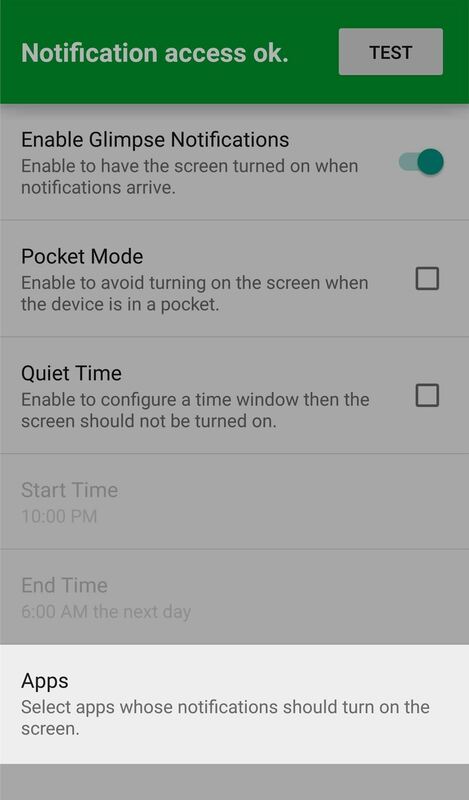 Unlike the Moto X with its Active Display or the Nexus 6 and its Ambient Display, some devices (especially those now running Lollipop) do not include a function that permits the display to turn on upon getting new notifications while the device remains locked or the display inactive. The purpose of these features is to notify users of incoming notifications while simultaneously also allowing them to briefly glance at them at their convenience. While you may feel left out if your smartphone doesn't include this, the developers at Nullgrad Apps have created an application just for you. Whereas Active Display and Ambient Display are specifically designed in black and white to help conserve battery life on AMOLED displays, Glimpse simply brightens up the screen when you get a new notification. Though it won't save power, it will allow you to view desired notifications and react in a timely manner. 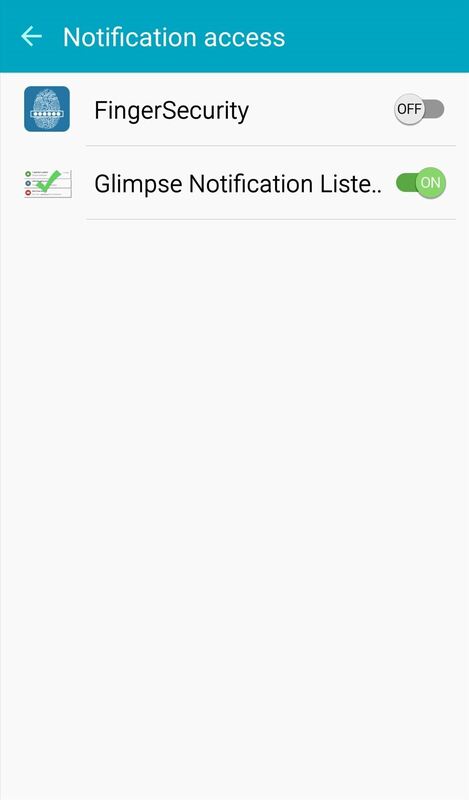 Install Glimpse Notifications for free from the Google Play Store. 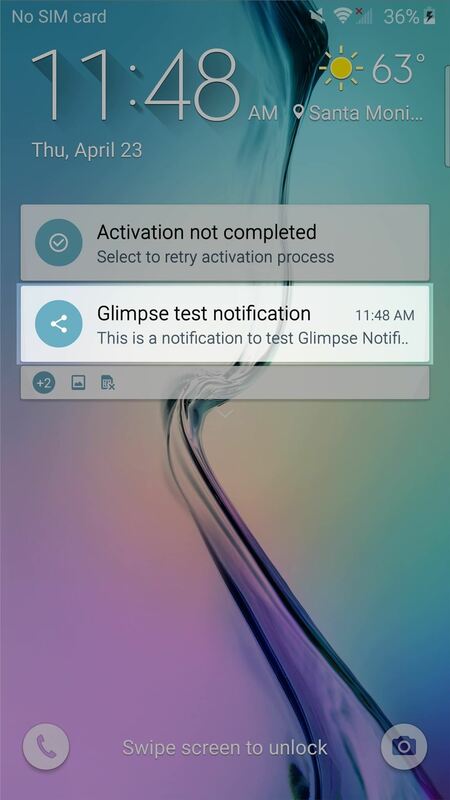 Glimpse will not initially work unless you enable notifications access for it, so hit the "Enable" button after launching the app. 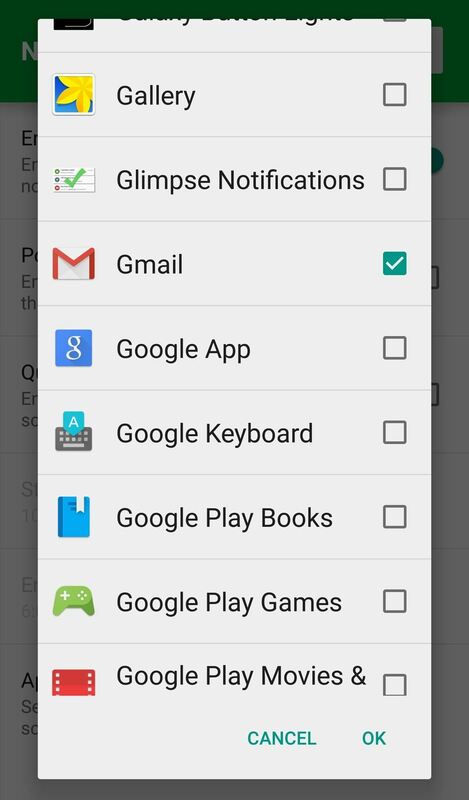 You'll be directed to the "Notification access" settings page where you can toggle it on. 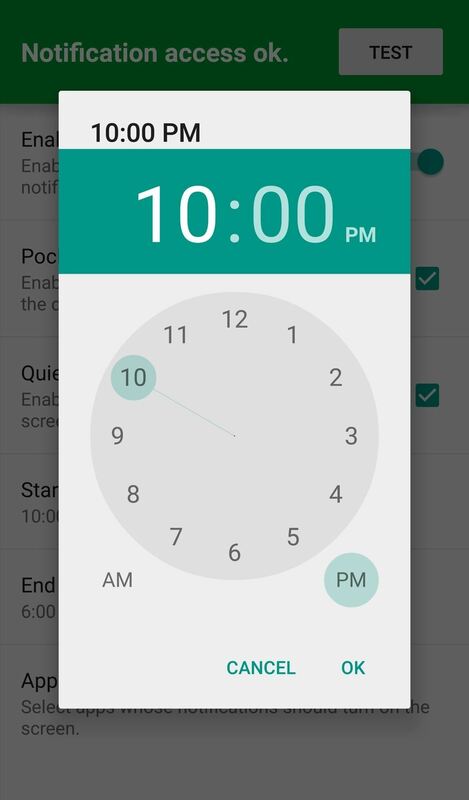 With the app activated, you'll want to select which apps will wake up the display. 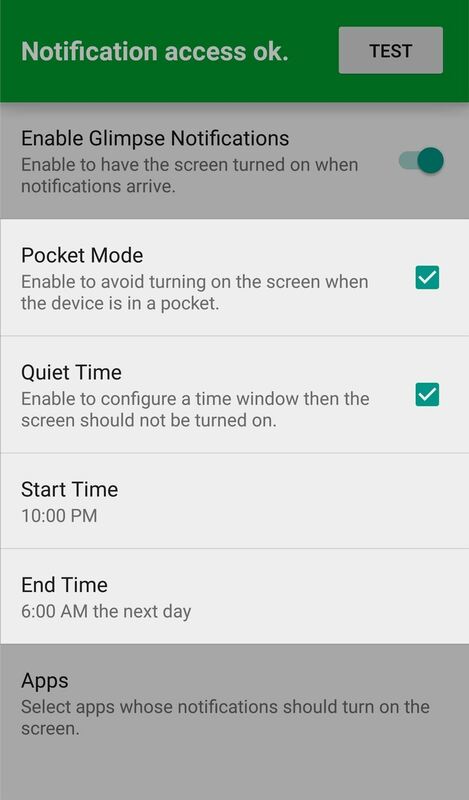 This feature will aid you in conserving battery life, as not all app notifications are vital or important for you to see. Additional features include Pocket Mode, which is meant to prevent the screen from turning on in your pocket, though I haven't had much success with it. 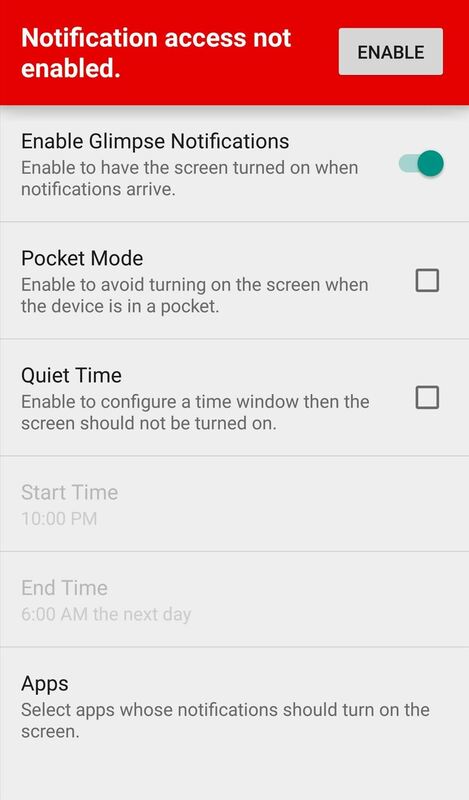 There are also Quiet Time hours you can set which will disable Glimpse for a specified period of time. Once you've set up the app, tap that big "Test" button, lock your device, and wait for the Glimpse notification to come through. It should wake up the device automatically, allowing you to view the notification without pressing the home or lock button. 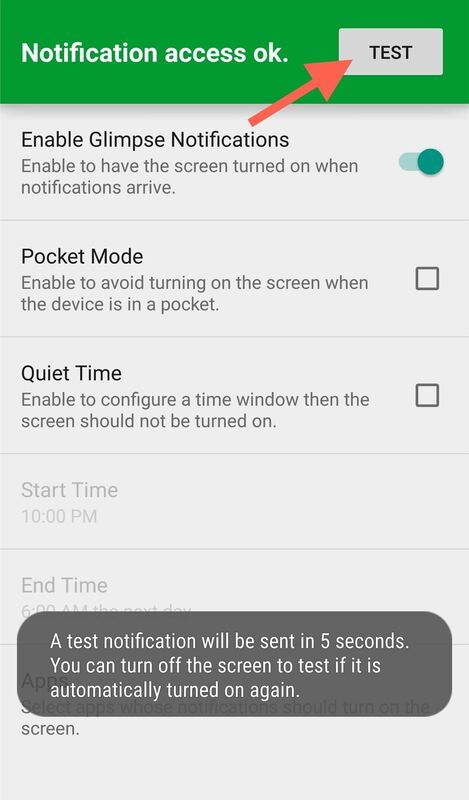 If this is something you've noticed and want to easily glimpse at lock screen notifications as they come in, then definitely give Glimpse Notifications a try.